The runoff forecast percentages in the Water Supply Update represent operating forecasts prepared by Reclamation, and may differ in values and timeframes from those published by the National Weather Service and Natural Resources Conservation Service. For official forecasts please contact those agencies. Call (208) 334-9134 for the daily streamflow recording. Email Melissa Jayo at mjayo@usbr.gov. 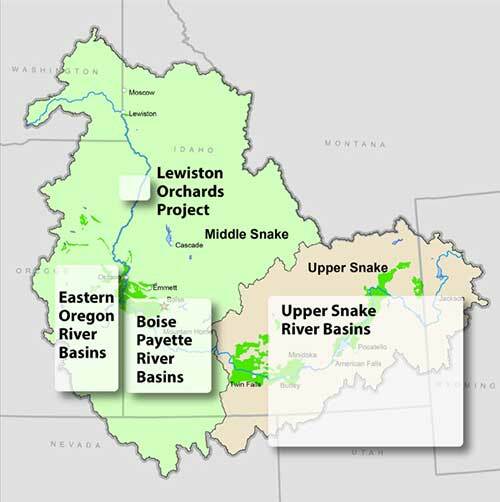 Email Alan Monek at amonek@usbr.gov. Click on the basin name to view reservoir storage diagrams including daily average streamflows. Owyhee Dam Boat Ramp at Owyhee Reservoir is permanently closed due to safety issues. Please use other ramps in the area such as the Gordon Gulch Ramp in Lake Owyhee State Park 2 miles south of the Owyhee Dam Boat Ramp, or the newly reconstructed Indian Creek Boat Ramp 4 miles south of the Owyhee Dam Boat Ramp.